(mineralogy) A variety of green quartz, used in ancient times for making engraved ornaments. (medicine, dated) A mixture of starch and glycerin, used as a substitute for ointments. (computer graphics, demoscene) A visual effect in which cycles of changing colours are warped in various ways to give the illusion of liquid organic movement. Most of the known universe is in a plasma state: stars (like the sun), lightning, etc. Source The core of plasma ranges in temperature from 11,000° – 14,500° Fahrenheit, thus limiting its applicable uses. As an ionized gas, plasma's electron density is balanced by positive ions and contains a sufficient amount of electrically charged particles to affect its electrical properties and behavior. We focus on a low energy version of the first definition listed above: the fourth state of matter. Gases turn into plasma as they reach a thermal heat and ionize. Plasma discharges exist in a wide range of conditions. Their particular properties depend on a variety of parameters including pressure, temperature, and density. 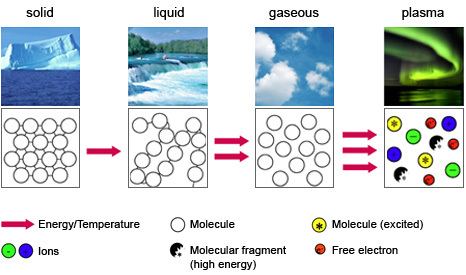 Plasma gas temperature is largely dependent upon average energies of particles and their degrees of freedom (translational, rotational, vibrational, and electronic). Such energies are achieved via electron-electron collisions and electron collisions with heavy particles, which result in ionization of the heavy particles. Depending on the frequency of collisions, the energy (and hence temperature) of plasma components (electrons and heavy particles) can be different. As a result, the plasma can exist in a non-equilibrium state. like plasma TVs and metal cutting torches. In NTP, electron temperature is highest (usually 10,000K or 1 eV); however, rotational excitation temperature, ion temperature, and heavy particle temperature are all quite low (room temperature). Under such conditions, high energy electrons lead to the formation of active chemical species and radicals, such as atomic oxygen (O) and hydroxyl (OH), and electronically excited oxygen (OiAG). These plasma-generated radicals and ions behave like catalysts and participate in chain reactions that promote or accelerate reaction pathways. Conversely, Thermal plasma is often characterized by temperature equilibrium. Therefore, the temperature of all energy levels and components are nearly equal. In thermal plasma, the joule heating effect results in high gas temperature. In thermal plasmas, energy is used to heat the entire gas, and temperatures often range from 10,000- 100,000K (10-100 electron volts (eV)).